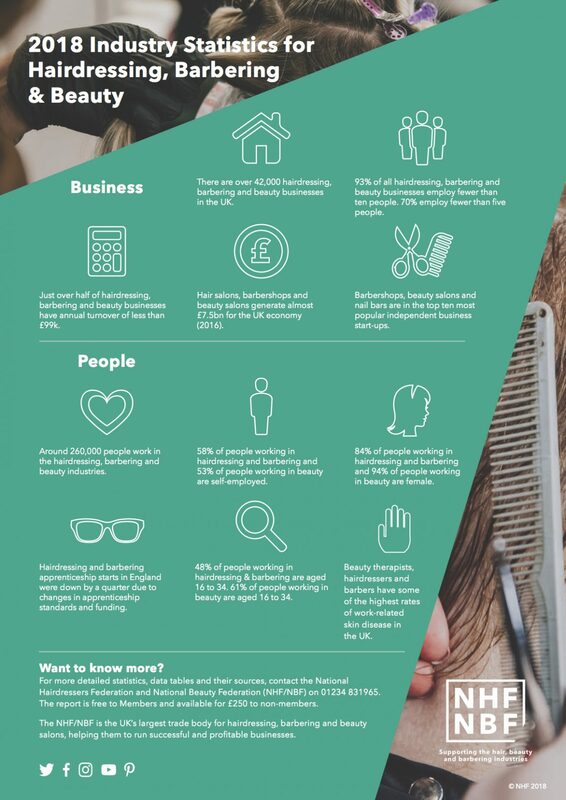 The National Hairdressers Federation releases annual stats on our industry and the 2018 figures are just out. This is a neatly packaged, understandable presentation of business in hairdressing including average turnover, employment, working patterns, age, gender, trends in salon start-ups and business success, apprenticeships and health. Apparently hairdressing, barbering and beauty businesss per se are up 2% to 42,370 in the UK (concentrating on London, the SE and the NW) with the majority ‘micro-businesses’ and 93% employing fewer than 10 people. BUT contributing almost £7.5billion to the UK economy now, up from £7bn. Something to be PROUD of and share with your clients and colleges, surely. Why not add in to your job ads and when seeking apprentices. The top 10 list of most popular business start-ups includes barbershops in the top spot, followed by beauty salons at number two and nail salons at number 5. Hair and beauty salons are showing growth, but the number of salons offering only hairdressing is starting to decline, with 217 more closing than opening in the last year. There has been drop of around 10,000 people working in the hair and beauty industry, down from 270,000 to 260,000. Hair: 162,000 people work in hairdressing or barbering which is dominated by females (83%) and young people with almost half aged 16-34. 58% are self-employed, similar to last year. There has been an increase in part-time employees, from 45% to 49%. Beauty: 97,000 work in beauty, which is almost entirely made up of females (94%), with young people making up almost two thirds (61%) of the workforce. 53% of people working in beauty are self-employed, similar to last year, and there has been an increase in part-time working from 43% to 52%. In common with many other sectors, the number of hairdressing and barbering apprenticeship starts in England is down by a quarter from 15,450 to 11,486. The decline is due to changes to the apprenticeship standards and to apprenticeship funding which meant that employers were having to make a financial contribution of 10% towards the cost of training and assessment (£900 per apprentice) for learners unless they are 16-18 year olds (or 19 or over with a local authority care plan). Hilary Hall, NHF/NBF chief executive, commented: “We have campaigned hard against the introduction of employer contributions, and we were delighted that the government announced in the Budget that contributions would be halved by April 2019. With other changes to apprenticeship funding, this means that employers will be paying £350 per apprentice rather than £900.